Tompkins VIST Bank CEO Scott Gruber (third from left) recently presented a $2,000 donation to Children’s Home of Reading’s President and CEO Dr. Vincent LaSorsa (left) at the Reading Public Museum. 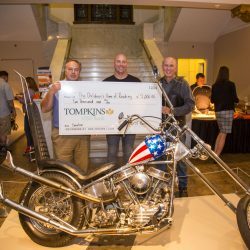 The funds were for the children’s creation of motorcycle-themed drawings to highlight the bank’s sponsorship of “Hit the Road: Classic Motorcycles” exhibit at the museum. With them was Kevin Kodz (center), owner of Classic Harley-Davidson.